It is estimated that between 10-15 per cent of rehabilitation officers in the UK who work with people with a vision impairment have a sight condition themselves. However, a rehab officer with VI, Rod Wilson, wrote an article for NB in 1985 in which he explains how he didn’t feel people with VI were taken seriously enough in the profession. Look back in the NB archive to find out why. First, a few words about myself. I am a registered blind person who nonetheless retains a useful degree of vision. My ability to read and define small details is somewhat restricted, but I have no trouble in getting about. I was trained as a mobility officer in 1966 and was a student on the first course to be held in the UK, organised jointly by RNIB and St Dunstan’s. I have been employed at RNIB’s rehabilitation centre at Manor House, Torquay, ever since, firstly as a mobility officer and latterly in the area of vision assessment and vision training, generally co-ordinating the low vision service. At the time of my training, the so-called rule that mobility officers had to be fully sighted and a drive car had not been established in this country and I am sure that if I were to apply today for a course of training to qualify as a mobility officer I would be turned down on visual grounds. This rule which effectively prevents visually-impaired people from becoming a mobility officer has been of concern to me for some time now, especially as I appear to contradict it. I have worked successfully in this field for a considerable length of time, yet I have a substantial visual defect. One of the objections which have been put forward as a reason for not admitting visually-impaired people into the ranks of the profession is that of client safety. During my service at Manor House I have been instrumental in training many visually-impaired people in orientation and mobility skills. At the last count, the figure stood at 500 plus, and that was several years ago, so I can probably claim to have trained more people than any other mobility officer in Britain. During that time I can honestly say that none of my clients have had an accident either on a lesson or as a direct result of my training. One or two have brushed against a post or missed the odd down-kerb, but these occurrences have been allowed to happen in order to reinforce cane technique with particularly difficult clients. Generally speaking, then, it is my firm belief that, while understanding the concerns expressed by others, the whole question of client safety is one that has been grossly exaggerated. While I appreciate that there are difficult situations, it is my belief that they can be overcome and minimised to an acceptable level. Orientation is the key to successful independent travel. I am convinced that these skills can be taught by a visually-impaired instructor just as well as a fully sighted one, and in some respects event better. Cane technique in a travel programme, although important, is a secondary skill which is used as a means of detecting drops and objects. 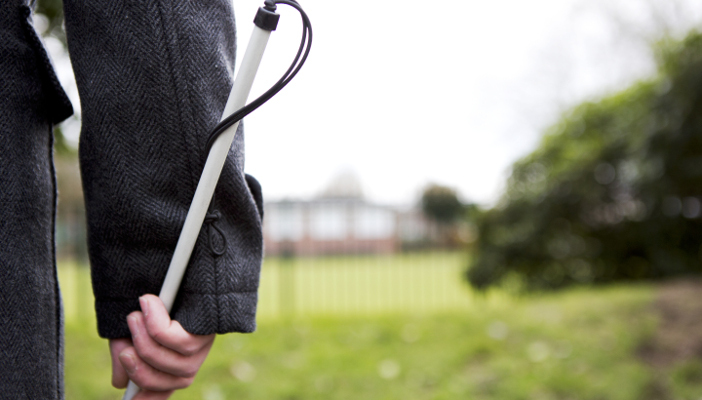 As such, cane technique is used as a back-up for a person’s skill in using his environment as a travel aid. In any teaching situation an important aspect is the relationship which is formed between the client and the instructor. This does not depend on whether the instructor is fully sighted or totally blind or somewhere in between but on the interaction between them. The building up of a good relationship goes a very long way towards achieving success, and in a lot of cases any failure can be put down to a fundamental flaw in this relationship. It seems to me therefore that more credence should be given to the personality of the potential mobility officer to form good relationships than to whether he or she has full sight. Having said that, sight is not such an important factor in forming relationships with clients, I feel that I must point out that many clients on leaving the rehabilitation centre in Torquay have said to me and to my visually-impaired colleagues how glad they were in the same boat. It would seem from such remarks that our clients receive that indefinable extra from the knowledge that professionals employed in the field are themselves visually-impaired people who have learnt to overcome the many difficulties which poor sight presents. I maintain that, given the opportunity, visually-impaired people could do a first-class job of teaching orientation and mobility skills in most situations, and that the maxim of where there’s a will there’s a way holds true. The notion that to allow visually-impaired people to become qualified mobility officers would mean a lowering of standards (which has been voiced to me in some quarters) is one that I feel is an affront to all those visually-impaired technical officers and to me personally. Finally, I would like to point out that this has been written from a personal point of view and so represents my feelings and ideas on the subject. It does not necessarily represent those of my employer. Enjoyed this article? Why not read On this day... in January 1917 or On this day... in February 1989.